You’ve probably seen them by now, those spinning blue Shazam icons that are popping up in an increasing number of TV commercials. Occasionally you also see them during programs themselves encouraging viewers to use their smartphone to capture the audio signature so they can tap into additional mobile content related to the advertised product or program. The idea is to make TV more engaging with mobile and provide better ROI. The question is: in which programs might a Shazam-integrated experience have the greatest impact? Experian Marketing Services combined new data from our Simmons Connect mobile and digital panel with our Simmons Multi-Media Engagement Study to find out. It turns out that programs with high concentrations of viewers who use the Shazam smartphone app don’t always have audiences that are highly engaged with the program’s advertising, presenting the networks with both challenges and opportunities. For example, the show that has the highest concentration of Shazam users, Glee, has below average scores on key ad engagement metrics. (See table below.) 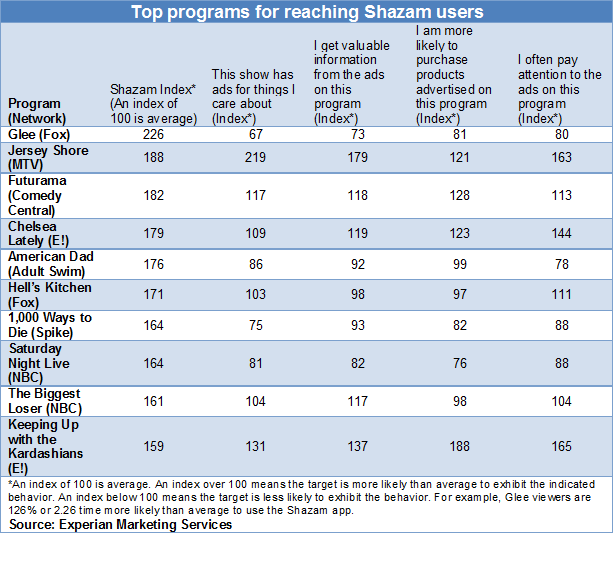 Specifically, Glee viewers are twice as likely as the average U.S. adult to use the Shazam app (index 226). But they are 33% less likely than viewers of the average TV show to say that Glee has ads for things they care about (index 67). Likewise, the Glee audience is 20% less likely than average to say they pay attention to ads that air during the show (index 80). Of course that doesn’t mean that Glee can’t provide viewers with a valuable and engaging Shazam experience. In fact, Glee has above average scores when it comes to important program engagement metrics. 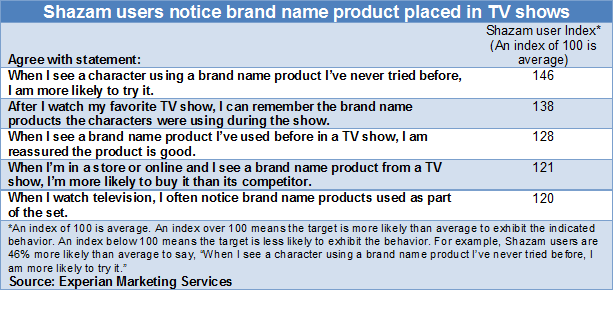 And equally as important is the fact that Shazam users are more likely to both notice products placed within the context of a TV program and to say that they are more likely to buy those products. (See table below.) As such, Fox has an excellent opportunity to create a Shazam-integrated experience within the program itself. Advertisers looking to include a Shazam-integrated experience within the context of their ad may want to consider Jersey Shore on MTV, Futurama on Comedy Central or Chelsea Lately on E!. All three shows have exceptionally high concentrations of Shazam users as well as strong scores on key ad engagement metrics. For instance, viewers of Jersey Shore are 88% more likely than average to use Shazam, but Jersey Shore viewers are also more than twice as likely as viewers of other programs to say that the show has ads for things they care about and 63% more likely to say that they often pay attention to ads on Jersey Shore. Regardless of whether a Shazam integration is included within the confines of a 30-second spot or within the context of a program itself, advertisers and networks that partner to create customized Shazam experiences for their target audience may both reap benefits in the arrangement. First, the advertiser gets measurable stats on customer engagement with their advertising content and potentially a means to engage them directly in the future. Second, the network gets an audience that is engaged on not just one platform, but two. The propensity of program viewers to use the Shazam smartphone app comes from Simmons Connect, an industry-first media planning and consumer profiling tool links more than 60,000 consumer elements to detailed insights on consumers’ use of 11 traditional and digital media platforms. Learn more about Simmons Connect. Program performance on key ad engagement metrics come from the Simmons Multi-Media Engagement study, a unique, media-neutral planning tool that goes beyond a simple measure of age, gender and/or clickstreams. Learn more about the Simmons MME study.